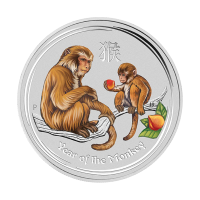 Obtain your 1 oz 2019 Perth Mint Dragon gold rectangular coin at the lowest price on the web! In Chinese mythology the dragon symbolizes power, excellence, boldness, perseverance, and nobility. 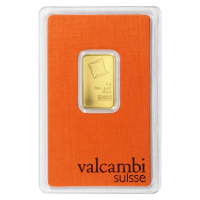 All of these facets are captured on this stunning rectangular 1 oz gold bullion coin. On its reverse, a coiled dragon is displayed suspended amongst the clouds as it chases a flaming pearl. The illustration conveys the dragons power and ambition as it is entirely focused on the pearl. The Perth mint “P” is featured close to the dragon for added authenticity. The obverse features Jody Clark's rendition of her majesty Queen Elizabeth II, with vivid lines radiating in the background. Crowning the bust of the Queen is her name, and the country of issue, its 1 oz denomination and 9999 pure gold stamp. 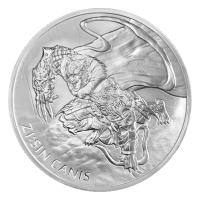 The gold dragon series comes with an extremely limited mintage of only 20,000 in circulation world wide, they are highly sought after by collectors and investors alike. Join the exclusive club of gold dragon bullion owners today! 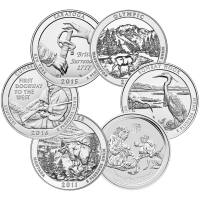 The coin you receive will come in a mint provided rectangular coin capsule. Vorderseite Jody Clarks Abbild von Königin Elisabeth II. sowie das Jahr und der Nennwert. Rückseite Ein Drache greift nach der Weisheitsperle. Jody Clarks Abbild von Königin Elisabeth II. sowie das Jahr und der Nennwert. Ein Drache greift nach der Weisheitsperle. 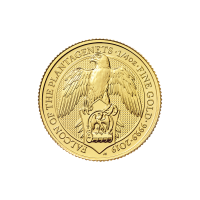 1 oz rechteckige Goldmünze - Perth Mint Drache 2019 Obtain your 1 oz 2019 Perth Mint Dragon gold rectangular coin at the lowest price on the web! In Chinese mythology the dragon symbolizes power, excellence, boldness, perseverance, and nobility. All of these facets are captured on this stunning rectangular 1 oz gold bullion coin. On its reverse, a coiled dragon is displayed suspended amongst the clouds as it chases a flaming pearl. The illustration conveys the dragons power and ambition as it is entirely focused on the pearl. 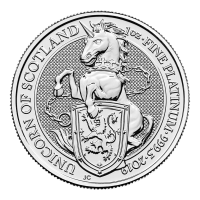 The Perth mint “P” is featured close to the dragon for added authenticity. The obverse features Jody Clark's rendition of her majesty Queen Elizabeth II, with vivid lines radiating in the background. Crowning the bust of the Queen is her name, and the country of issue, its 1 oz denomination and 9999 pure gold stamp. 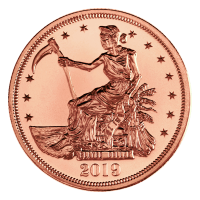 The gold dragon series comes with an extremely limited mintage of only 20,000 in circulation world wide, they are highly sought after by collectors and investors alike. 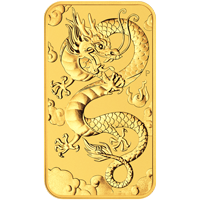 Join the exclusive club of gold dragon bullion owners today!